The Euro soared to its highest since February after the FED stopped increasing interest rates for this year and even implied a possible rate cut. Moreover, the US Central Bank sees the economy growing by 2.1% this year, rather than 2.3% growth foreseen last December. Powell also mentioned slowing growth in China, EU and Brexit uncertainty are major factors affecting their decision on whether to raise rates or cut them. If the FED finally decides to cut rates, we could possibly see a major bullish reversal on the single currency. Today, we have no economic data scheduled in the EU, so the attention will be on the UK, as the BOE will unveil its latest monetary policy decision. The US, on the other hand, will release its Initial Jobless Claims and the Philadelphia Fed Manufacturing Index. 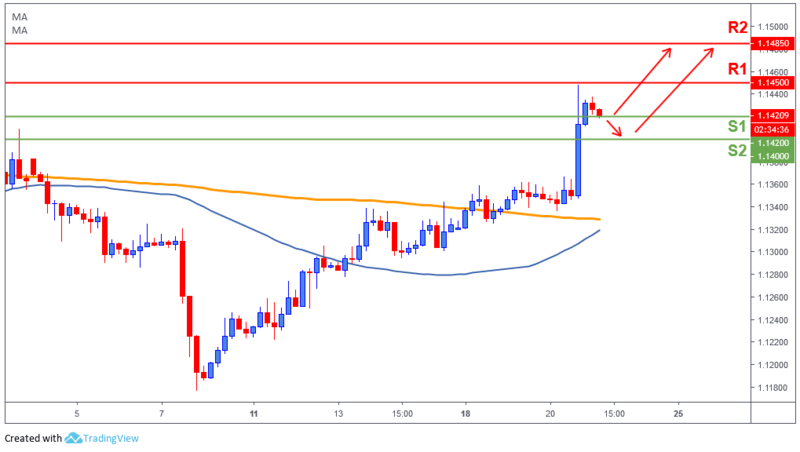 The Euro broke out from a major resistance level 1.14, which could potentially shift the short-term trend to the bull’s side. Price is currently testing 1.1420 (S1) as a potential new support if it fails then 1.14 (S2) will likely hold as the new major support for now. The bulls will try to retest yesterday highs 1.1450 (R1) and break it. If successful, then the next resistance level will be 1.1485 (R2).